The time between each frame is not known (the video clip was in slow motion). Michael Phelps' time for the event was 1:57.14. Frame #2: The right hand has entered the water and is angled down. That angle creates a momentary drag pocket that extends from the wrist, along the arm, to the upper back. [If the arm had been stretched out over the water before entry, this drag would not have occurred.] The left upper arm abducts causing some horizontal propulsion to be developed (although a vertical force component still is dominant). The swimmer holds a classic "catch-up" stroke position. The kick is substantial but not propulsive. The turbulence coming from the feet is above the legs and serves to maintain the legs and hips in a streamlined position. Frame #3: The right arm extends forward under the water and reduces the momentary drag that was displayed in the previous frame. The left arm propels the swimmer, with the upper arm being adducted. Better propulsion would have resulted if the upper and lower arms were aligned. The leading elbow allows some water to travel along both arm segments ("slippage"), which reduces effectiveness. The swimmer has good streamline. Frame #5: The right arm is fully extended forward on a maximally elevated shoulder. The propulsive left arm is hastily elevated in an exaggerated extraction. Left arm propulsion could have been longer indicating that this is not a maximally propulsive stroking technique (another fault of the catch-up technique). Frame #6: The left arm exits. The right wrist flexes as the swimmer begins to reposition the right arm for propulsion. At this stage, no propulsive forces are created by either arm and the swimmer has entered a stage of inertial lag. The kick is quite large (also an undesirable feature of the catch-up stroke). One can easily see how an excessive kick increases drag because of the angle of the lower right leg to horizontal. Frame #7: The right arm exhibits some medial rotation of the upper arm and flexion at the elbow. This is a good position that should start the repositioning of the lower part of the arm to produce a maximized propulsive surface. The swimmer's streamline is disrupted as the right knee drops lower than the cross-sectional shadow area of the torso. The angle at the hip is reduced. Frame #8: Unfortunately, the swimmer did not continue with repositioning the right arm to achieve a position of maximum propulsion. The upper arm is abducted while the lower arm is at an angle (near 45 degrees). This angle allows water to slide down the arm and off the fingers. The moving water will not allow a maximized drag pocket to form on the forward surface of the arm; the amount of drag force achieved being much less than potential. The swimmer's streamline is disrupted further with the head and shoulders being higher than the hips and thighs. Frame #9: Right arm propulsion continues. The upper arm is already adducting while the lower arm is not vertical. Streamline is compromised further as the left thigh drops out of the cross-sectional area shadow of the torso. The head appears to have been lifted out of the water, an action that would contribute to the lower half of the swimmer sinking as a reaction. The size of the kick is excessive. Frame #10: Substantial right arm propulsion ends in this frame. The head is well out of the water and front-half streamline is nonexistent. However, the streamline of the lower torso, hips, and legs is maintained. Frame #11: The right arm is withdrawn elbow first. Although the lower arm is slightly beyond vertical it is sliding rapidly upward and represents a shortened effective length of stroke. The left am has entered and immediately presses down and forward. The head returns contributing to the recovery of streamline. Excessive kicking is again demonstrated with the right leg creating detrimental drag but serving the primary purpose of counterbalancing the downward press of the left arm. Frame #12: The right hand exits the water. The left arm presses down. No propulsion occurs. The head is still turned as the swimmer breathes. Frame #13: Inertial lag continues. The right arm is in recovery and the left arm presses down. The body has rolled onto the left side and inhalation continues. Frame #14: Inertial lag continues because there is no obvious movement that could contribute to propulsion. The left arm appears to be bending at the elbow and abducting at the shoulder. The head begins to return from breathing. Frame #15: The left arm still does not appear to contribute much, if anything, to propulsion. The right arm is almost ready to enter. The head returns from breathing. Frame #16: The catch-up stroke cycle begins again. 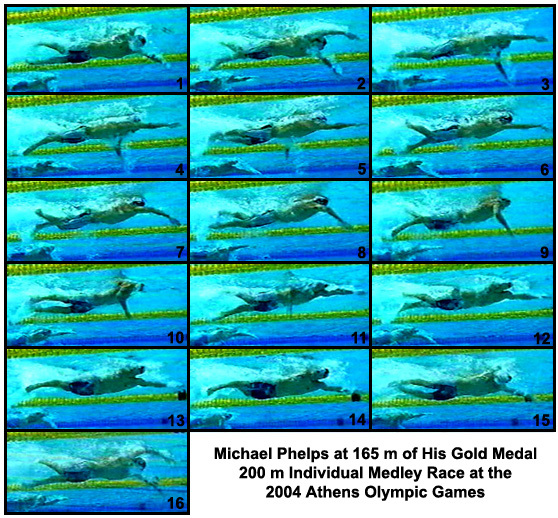 Michael Phelps has achieved some impressive 100m and 200m crawl stroke times despite these weaknesses in his technique. If they were removed and replaced with better form, there is no telling just how good this swimmer would be in this specialty stroke. The catch-up stroke needs to be replaced by a counterbalanced stroke. If that is done, the effective length of stroke backward would be increased and inertial lags minimized. The repositioning of the hand/forearm needs to be completed before abduction of the upper arm occurs. Currently, the positioning of the hand/forearms is such that slippage occurs. The head lift action before inhalation should be eliminated. The brief disruption of streamline will slow the swimmer. The time spent in the breathing action needs to be reduced. The size of the kick needs to be reduced. However, it is difficult to tell if the kick is large because of the poor technique features, or at least some of the poor technique features are caused by the large kick. The recovering arms should be stretched out over the water, rather than knifed in and down underwater.